Discussion in 'UPS Freight' started by nxsone, Nov 8, 2018. Does anybody know when and how we'll find out final results? I'm sure some unofficial vote count will be trickling in, but the total will probably known sometime Sunday evening. There is always a trend in a vote count. The vote starts out tight it'll usually remain tight throughout the count. If the moves big in either direction, that trend will usually go throughout the count. There will always be statistical outliers. aztec warrior and Homesick like this. I’m sure they’ll be available on the IBT and local websites. If this goes through, how long do you guys think it will be before they start bringing us in for work? This is just HRS. Check with your local. aztec warrior and UPSFreight like this. Probably a few trickles in on Monday or Tuesday. The outcome of the election will be known long before Sunday. Vote counts leak out all over the place. The 2013 election was over before Sunday.the trend was so overwhelmingly yes there was no way it could be reversed. Leaking results before the final votes are counted could potentially land the union in court. What about a the Russians meddling in the election? What about hanging chads? Lol! Trucker 206, SuperCourse, Big Dave and 1 other person like this. Lol! The leaks will come from the members who witness the counts. aztec warrior and abfempm like this. I’m voting NO! Someone asked me how I was voting l told him NO! He ask me how can l do this to him and he started crying. George David, Fat-boy-74, buffalobill and 2 others like this. I spoke with someone who has a cronic illness and if they lose their medical coverage with a misguided and wreckless strike, they wont be able to afford their medication, because our great medical benefits will stop. Think about that when you are mocking people. 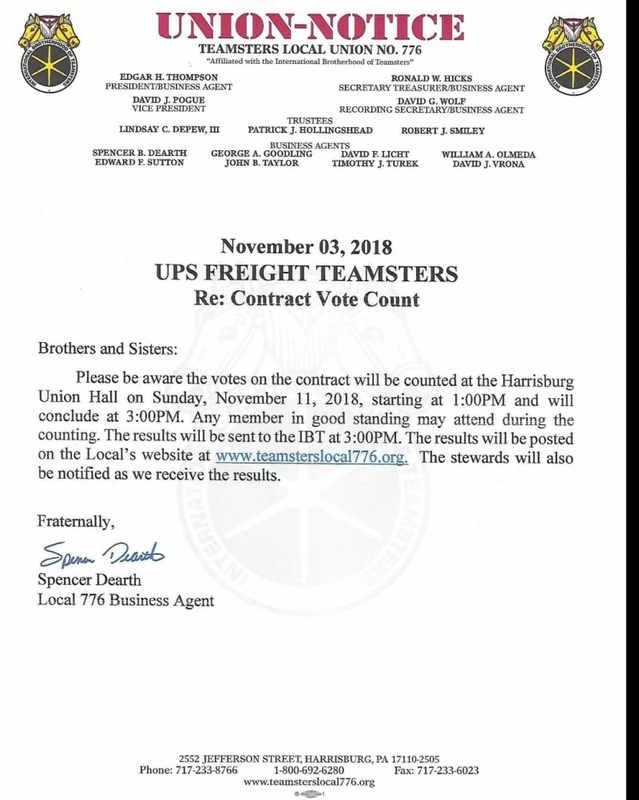 I thought the vote in Harrisburg was Sunday? Its gonna be cold outside on that strike line.